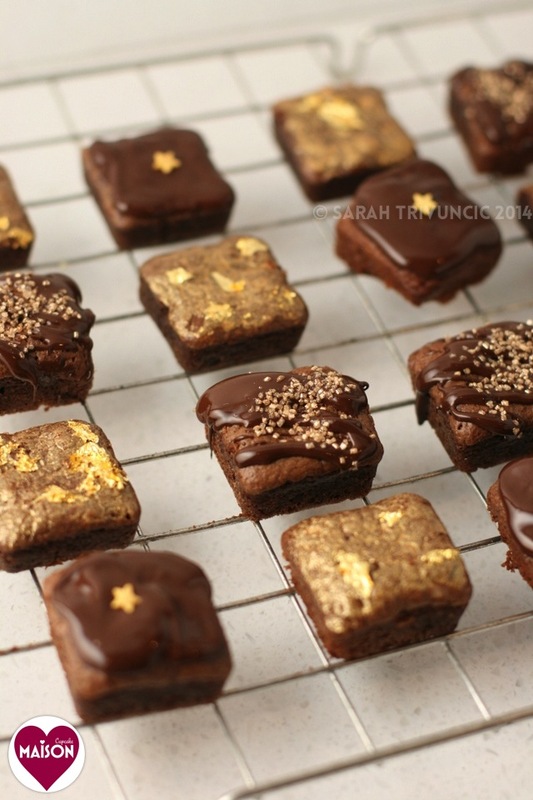 There’s gold in them thar brownies, there is. Readers above a certain age may remember when Nigella wrote the food column in Vogue. I used to buy Vogue on a regular basis when I was a fashion student (happily forgotten past life) and only carried on buying it afterwards because I loved Nigella’s monthly Vogue food column so much. When moving out from some flat or another I tore out Nigella’s food columns, kept only these pages and threw the magazines away. I still have these clippings and one of the ones I loved the most was a Christmas column with baked goods decorated with edible gold leaf. Bearing in mind at the time, pre-celebrity-stardom-era Nigella lived a hop and a skip and a jump from me in Shepherds Bush. 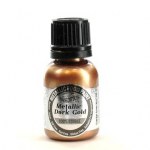 I was reading this thinking, where the hell does someone buy edible gold leaf. (I can vouch Nigella didn’t find it in the local branch of Safeway). Naturally these days I’d hop on the internet and look for it. But these were the dark days of the mid to late 1990s when merely visiting The (what constituted then as “viral”) Blair Witch Project website could grind your bleeping computer to a halt. So harking back to the carefree halcyon days when I lived in the same neighbourhood as Nigella, as Daniel Craig, as Ant & Dec (ok we’ll forget that one), I call to mind my pre-child days when my husband and I actually went out for Valentines. When my husband and I first got together, and these were very naive days indeed, neither of us appeared to previously have been dating anyone during February. Needless to say, with everywhere fully booked, we ended up in the curry house and I used this fact to tease him thereafter and he never dared not book a restaurant table for Valentine’s ever again. But times change and after moving into our “grown up” house and having our son, going out for Valentine’s isn’t especially practical. 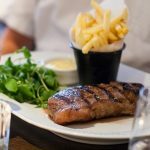 Neither in these commercially driven times is it even desirable – I would rather go out the weekend before or after rather than suffer an overpriced fixed menu. Then he’ll jest that the most memorable meal I ever made him was the first one and it’s all been downhill ever since. 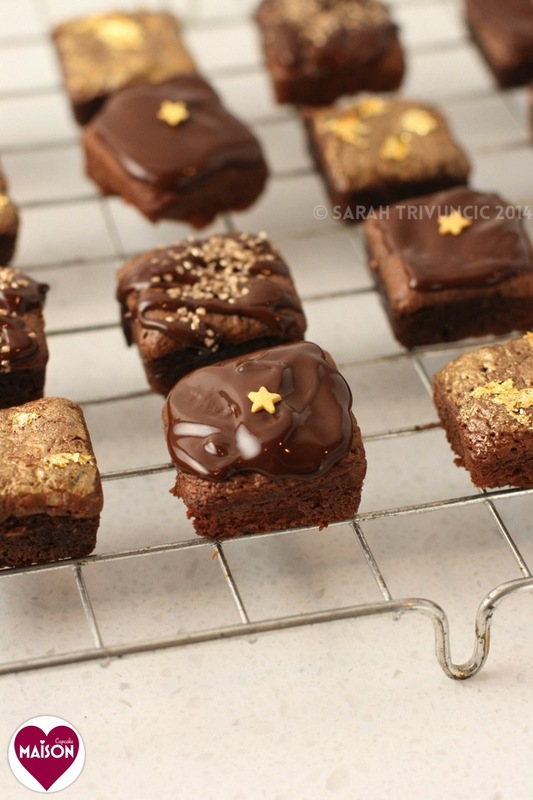 I have completely forgotten to mention that these brownies are gluten free. Pretty much any brownie recipe can be made with gluten free or non gluten free flour so feel free to substitute if gluten free is or isn’t your thing. The spicy kick in these brownies comes courtesy of Gran Luchito who are behind this selection of hot products featuring Oaxacan smoked Mexican chilli. The range includes mayonnaise (“like crack” according to my friend Katie), honey and a paste. The honey is fab on toast, used in marinades or glazes on meat or fish. The mayo is incredible in sandwiches or my personal favourite, a warm potato salad. I have also featured it on my family food site Dinner With Crayons in these heuvos rancheros and stuffed peppers with blackeye beans. 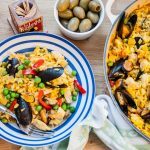 Apart from M&S, Gran Luchito is so far mostly sold by places like Fortnums, Harvey Nick’s and Wholefoods – however my local (award winning no less) branch of Spar in Walthamstow Village also stocks it just around the corner from me. And yes, I’ll get around one day to blogging about the awe inspiring odyssey that is Walthamstow Village branch of Spar. 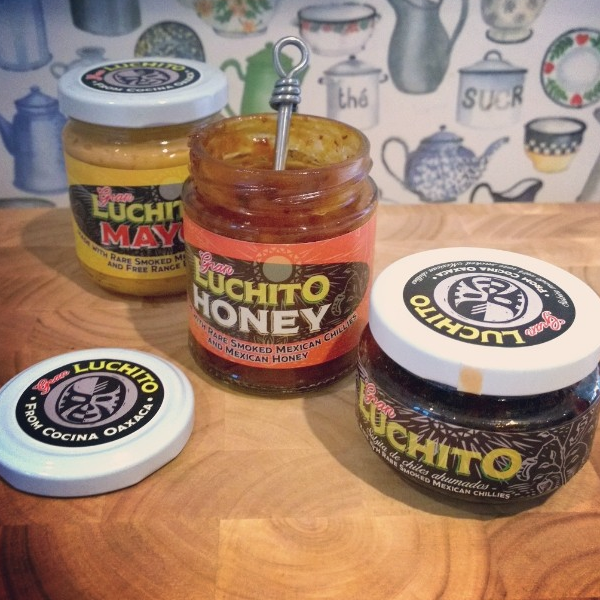 If the big smoke is some distance away and you’re less blessed in the Arkwright style small local convenience store stakes click through to Amazon’s Gran Luchito range. To melt cooking chocolate I use a Lakeland chocolate melting pot like this one above. For quantities under 100g, microwaving in 2 consecutive 45 second spells (my microwave is 800w) should be about right but experiment with shorter bursts in your own machine to avoid scorching the chocolate. I used a Mich Turner Silverspoon range gold lustre paint to coat the tops of the brownies which is sadly no longer manufactured. You could find similar elsewhere such as this Rainbow Dust edible pearlescent food paint at Hobbycraft. 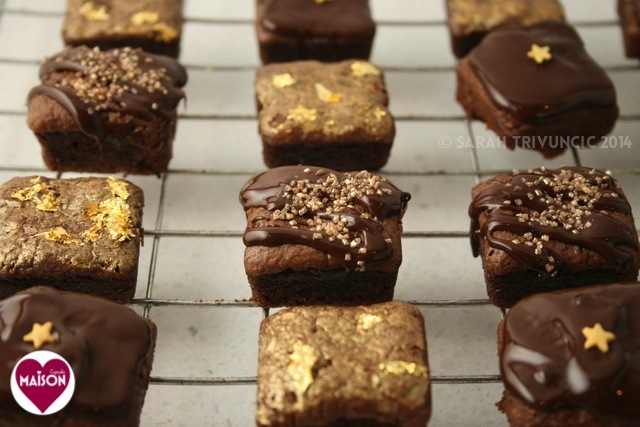 The edible gold leaf was by Squires Kitchen but purchased in Waitrose baking aisle. 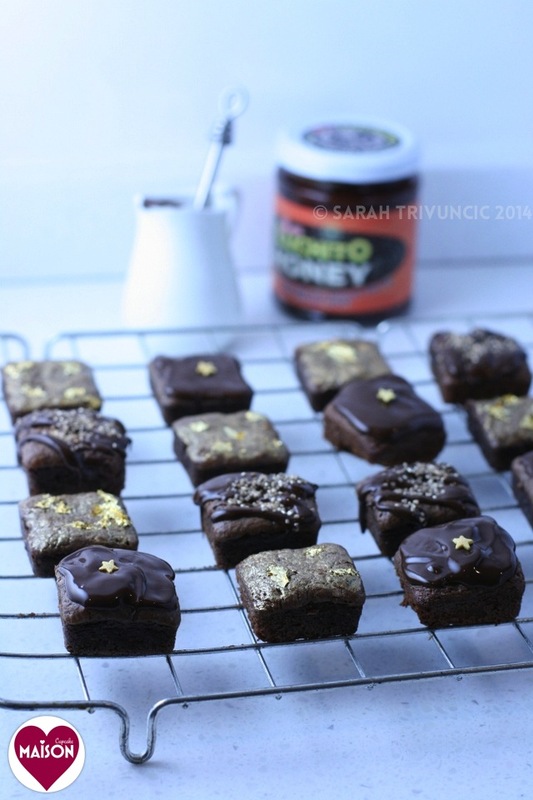 A tiny pot costs around £5 but a little goes a very long way, I only used a tenth of the contents to put gold flecks on 8 brownies. 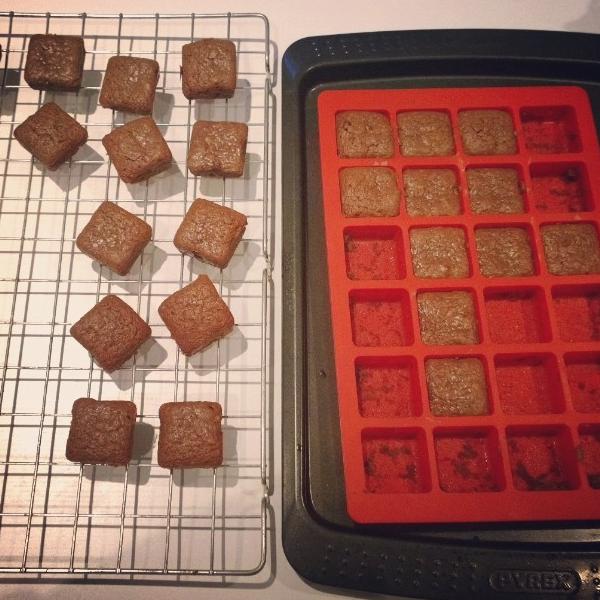 The mini bitesize brownies mould is by Lékué who specialise in silicone bakeware. I am currently road testing a selection of their products and will expand on these in a future post. This Lékué mould is available from Amazon (currently £15.50). 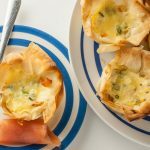 A luxurious and decadent sweet bitesize bake suitable for Valentines' dessert or dessert party canape. May also be baked as a tray bake. Using a double boiler or a heatproof bowl over simmering water, melt the butter and chocolate together. Once combined, turn off the heat and leave to cool slightly. Meanwhile in a medium size bowl, beat the eggs, sugar and smoked honey together until smooth. Beat the chocolate mixture into the egg mixture and then sieve over the gluten free flour and finally the dessicated coconut. Stir until combined. Decant brownie batter into the moulds/tins and bake for around 12 minutes. The tops should crust over and raise slightly. Allow to cool for a few minutes before pushing out of the moulds and cooling completely on a wire rack. When the brownie bites are cooled, melt the dark cooking chocolate. 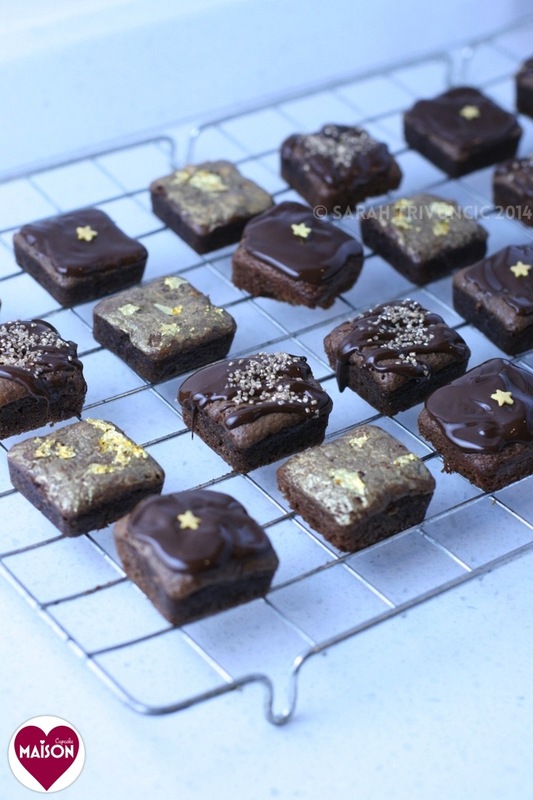 Decorate the brownies by streaking with molten chocolate and scattering with sprinkles; by topping with a single gold star; or paint with gold lustre edible paste and fleck with edible gold leaf. Oaxan smoked chilli honey could be substituted with normal runny honey and a teaspoon of chilli paste. For extra kick you can also add a bonus teaspoon of Oaxacan smoked chilli paste as well as the honey. 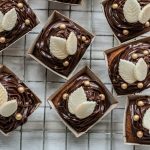 You will need a mini baking mould/tin to make a bitesize version - I used Lekue’s silicone mini brownie mould but if you don’t have one of these either mini muffin cases or a tray bake version could be used. Recipe post commissioned by Gran Luchito for a fee. Brownie mould supplied by Lékué. 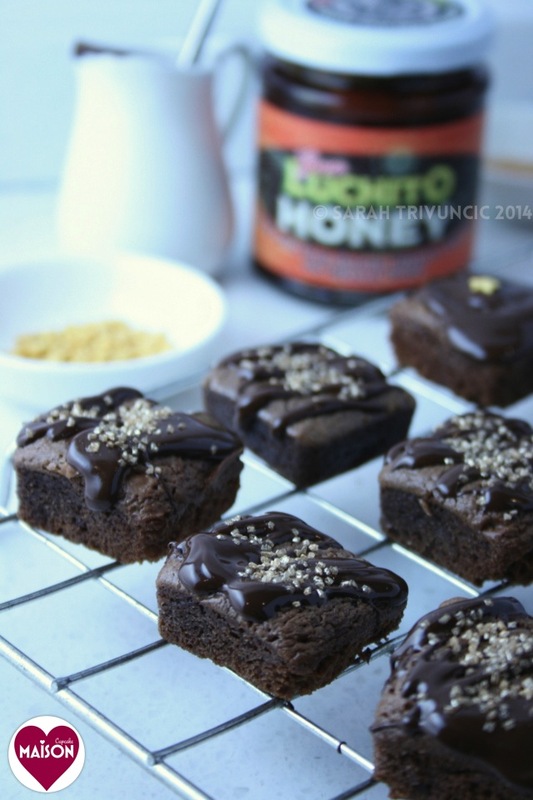 What a heavenly idea using the Luchito honey in little brownies. 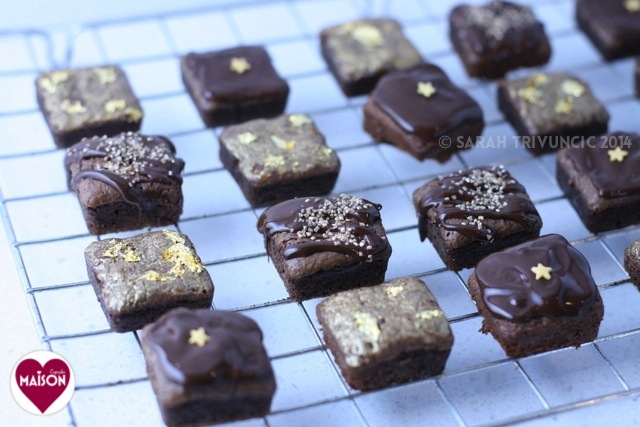 I have always wanted to make little bitesize brownies, I think they look stunning with the added gold lustre and gold leaf. I love your Valentine stories too and can relate to most of them. We haven’t been out on Valentines for years preferring to spend the cash on a really nice bottle of wine and normally some sushi or seafood. 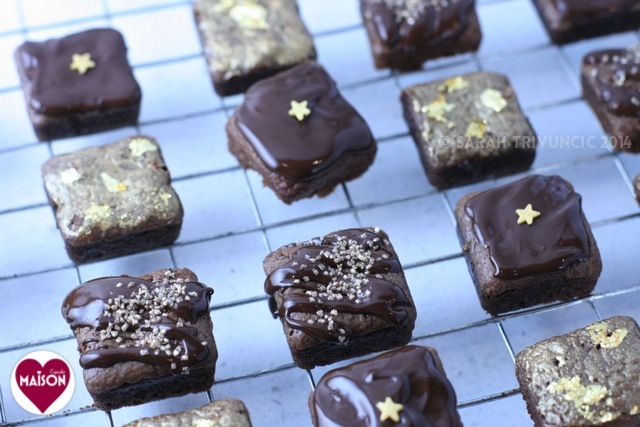 These little brownies could be our decadent dessert! 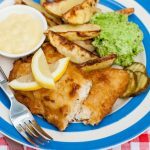 Thanks Laura – we tend to do the same thing – a more interesting piece of meat or fish than the norm alongside some bubbly. And if I really want to push the boat out I *might* manage a tablecloth!!! Cute! And omg you lived in the same neighbourhood as Daniel Craig?!?! Hubba hubba! I’m sure tjese taste a good as they look and l love that silicone chocolate melting pot! I don’t anymore but he DID live in Shepherds Bush when I lived there before he was mega famous i.e. before Layer Cake. One of my favourite films with him in it called Some Voices was filmed all around Shepherds Bush including a scene outside the pharmacy on Uxbridge Rd right at the bottom of my street. I probably wandered past whilst some random film crew were doing something and never took any notice, oh the AGONY. And I understand Ralph Fiennes lived in W12 in mid 90s when with previous wife. I never saw anyone famous in W12, despite ridiculous proximity to BBC. Yet when I lived in Muswell Hill, you used to physically fall over celebrities. It was commonplace to be standing in a pub or queuing up at ATM next to someone from EastEnders or a vintage sit com. Only celeb in E17 is supposedly Brian Harvey but I’ve never seen him either, I think he keeps low profile these days!! god I’m old… and these are gborgeous! Loving these super-cute brownies, what a fab mould! Really enjoyed hearing your meanderings through pre-child days in Shepherds Bush. We probably walked past each other when I had my first flat there. I can’t bear restaurants on Valentine’s Day – forced romance is totally naff. Ah I know, I always forget that you lived there overlapping with me. Fuss Free Helen reckons she and I used to sit eating chinese food next to each other on Saturdays in Stick & Bowl in Kensington and statistically she’s probably right!! Brownie rocks today! Yours looks delicious, with Luchito which I love – lush! These look wonderful and very chocolicious I love the idea of adding the chilli twist.I am sure they taste super. I do like chilli and chocolate as a combo and small bite sized brownies may fit in with my diet too, so these have my name all over them! These dainty little treats look heavenly. I think chilli and chocolate is such an amazing flavour combination, with the addition of gold leaf to add grandeur! 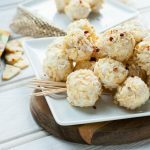 I would stay at home and munch on an entire of these (possibly without my OH knowing, so I don’t have to share!) than go out and eat at an overpriced restaurant on Valentines Day. And I see you don’t live to far from me 🙂 I haven’t been to the Spar but have been to Eat 17, which is next door. I will def have to pop down one day and check out the convenience store. They stock all my favourite products, Bim’s Kitchen sauces, Gran Luchito honey etc. And you used to live in Muswell Hill? I was born and raised in Finchley until I got married and moved over to what I like to call, the ‘dark side’. I’ll always be a north London girl at heart. Ooh we’ll have to meet up if you’re semi-local. Eat 17 is great, their burgers are the business. When I was a student in the mid 90s I lived in a flat on Muswell Broadway for a year. Before it was posh! The tales I could tell…! Thanks – I’m especially pleased with how the coconut didn’t fade into the background. Delightful brownies! 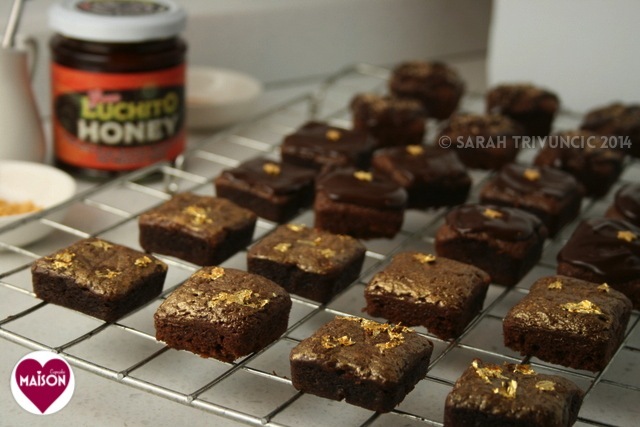 I still have half a jar of Luchito honey, very tempted to bake your brownies. 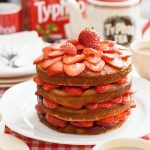 You only need a spoonful – try it! very pretty! I really like the gold bits…I’m so sad and superficial!!! Noooo everyone likes sparkly stuff even if they don’t admit it! She was indeed, she wrote general columns for broadsheets that were nothing to do with food. I think food writing was quite an unexpected avenue for her and just took off. But she’d been writing the Vogue column for a good year before How to Eat came out. lovely pictures, and I have a love hate relationship with gold leaf as I find most of it sticks to my hands so it is an expensive waste. But it is really pretty and you clearly have a more delicate touch. These look as lovely as I am sure they taste. Yes I know what you mean. I think your hands have to be completely dry. Maybe use tweezers to tear bits off? Gran Luchito, chocolate and coconut surely must be a match made in heaven. You know I have never worked with gold leaf ever? Must admit, it was my first time too. Oh I do love a good brownie. An yours look so decadent with the extra layer on top. That kick of spice too, mmmmmmmm! Thanks – I think my brownies might look quite naked in future if I don’t do this!! Wow, you packed a lot into this one post Sarah – a true multi-tasking queen. These bites sound so good and they look really pretty too. I’ve never used gold leaf. I keep gearing myself up to buy some and then can never quite manage to pay the price. Thanks for adding these to WSC. I ADORE all the Gran Luchito products, and agree the mayo is like crack, I so can’t be trusted with it anymore!. The paste and honey are sublime too, have been using them quite a bit lately. 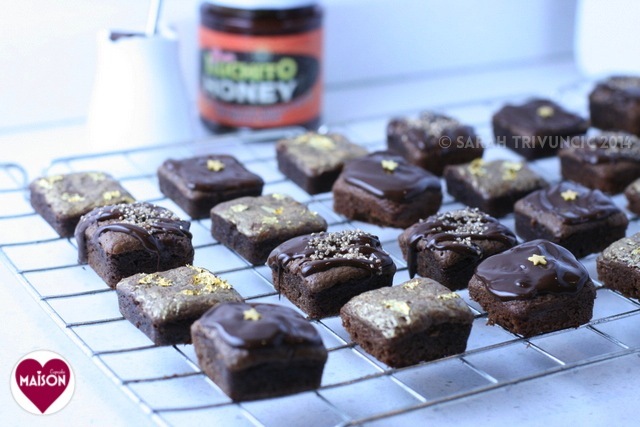 Great idea adding the honey to choccie brownies for a little chili kick, even better to top with gold! Totally magnificent. I have a selection of Lékué to road test too, must get busy with it soon. I completely agree with you abt the over priced fixed menus , I would wait and go on another day instead too ! 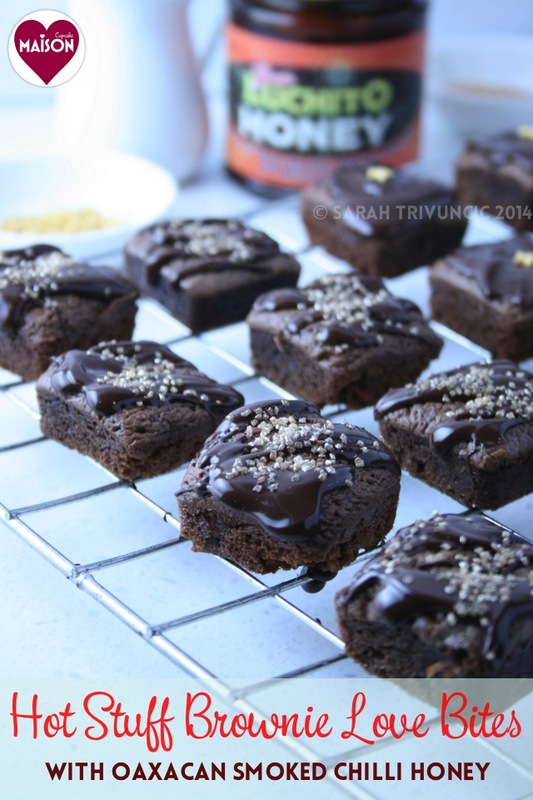 These not only look stunning – the chilli chocolate combo is such a great idea! Ahhh, good old Shepherds Bush, what a place! 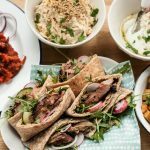 Actually, two of my favourite independant London brunch spots are there! I miss Cafe Rest on Goldhawk Road. An institution. And Zippy’s over the road. I think that Nigella was a very highly respected political and economic analyst in her day. Rather sad how she is now dumbed down. Anyway I digress, amazing brownies, and I really need that pan!